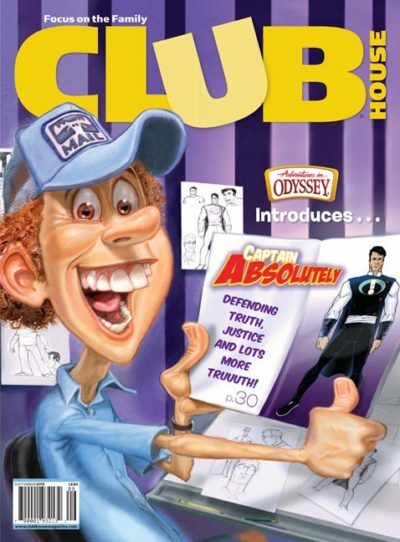 Wooton Bassett’s comic hero “Captain Absolutely” makes its official debut as a feature in the September 2012 Clubhouse magazine. The magazine, like Adventures in Odyssey, is celebrating 25 years and continues to provide stories, activities, and lessons to kids. “Captain Absolutely” first appears in the episode The Truth Be Told and has been featured in several episodes since. You can learn more about Clubhouse at their official website or subscribe here. Clubhouse has done a great job of promoting Adventures in Odyssey over the years, and 8 to 12 year-olds (and kids alike) have a new feature to look forward to.